So, finally we have it. The Republican “Tax Cut Plan” in all its glory. Mitt Romney and his Republican colleagues were intent on putting forth what they thought would be a nice series of tax cuts and popular, new, simple, reduced tax brackets. This is not actually reducing the burden on middle class families, it is increasing it. A new Joint Economic Committee Study exposes this sham of a plan. Making President George W. Bush’s tax cuts permanent and further reducing the top rate to 25 percent is truly class warfare, Robin Hood in reverse, stick it to the middle class. The fact is that to close the so-called loopholes and get rid of thecredits, many of which help the middle class, we are seeing a further redistribution of wealth to the wealthy. The Romney-Ryan plan would increase taxes on wage earners who make between $50,000 to $100,000 by $1,300. It would increase taxes on those who make between $100,000 to $200,000 by $2,600. Another great idea for taking us back to the Bush-era, on steroids. If you make between $500,000 and $1 million, you get another nice check for $35,000—go buy a new car or a big diamond ring. And if you happen to make over a million dollars, the average redistribution of wealth comes to an unbelievable $285,000. When Romney talks about the middle class needing help, it is not hard to figure out his definition of the middle class—those friends who have Swiss bank accounts and offshore stashes in the Cayman Islands. His plan, like Bush’s, would once again harm the middle class and help the wealthy even more. 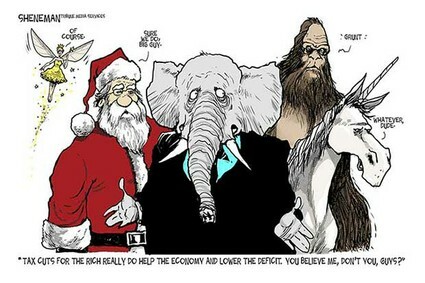 The report by the Joint Economic Committee shows one thing about Mitt Romney: The emperor has no clothes. Follow the Thomas Jefferson Street blog on Twitter at@TJSBlog.